This recipe was born out of pure necessity. Some friends were over one night and we ordered Mexican food and I needed some queso STAT. So, I figured blending up some cashews with hot water would work. Guess what? It totally did. 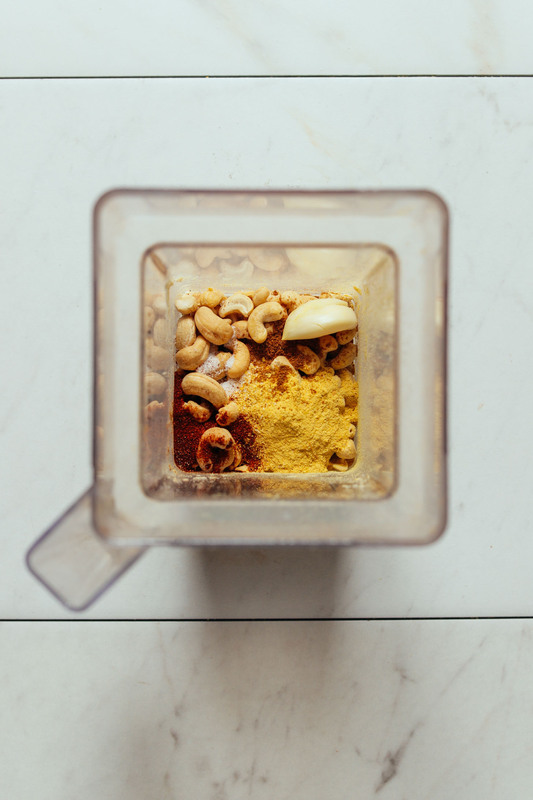 Typically I like to soak my cashews before blending, but in a pinch this little trick totally works! Because sometimes you just need queso and you need it right now — you feel me? 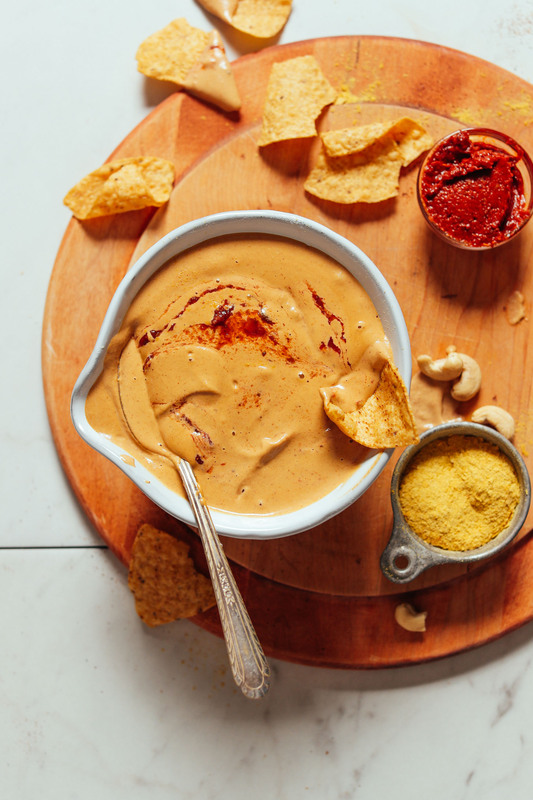 This queso is comprised of raw cashews, nutritional yeast, garlic, spices, water, and a little hot sauce or harissa paste blended to creamy perfection. That’s it! You can make it spicier, cheesier, or more garlicky to taste — the options are endless. This would make the perfect dip for Mexican night and beyond. Lately I’ve been keeping a jar around for adding to Cauliflower Rice Burrito Bowls, or just to dip with corn chips. Swoon. If you’re into queso, be sure to check out our Butternut Squash Bowl with Jalapeño Queso, Roasted Jalapeño Vegan Queso, Best Damn Vegan Nachos, Cashew-less Vegan Queso, and our Black Bean Plantain Enchilada Bake! 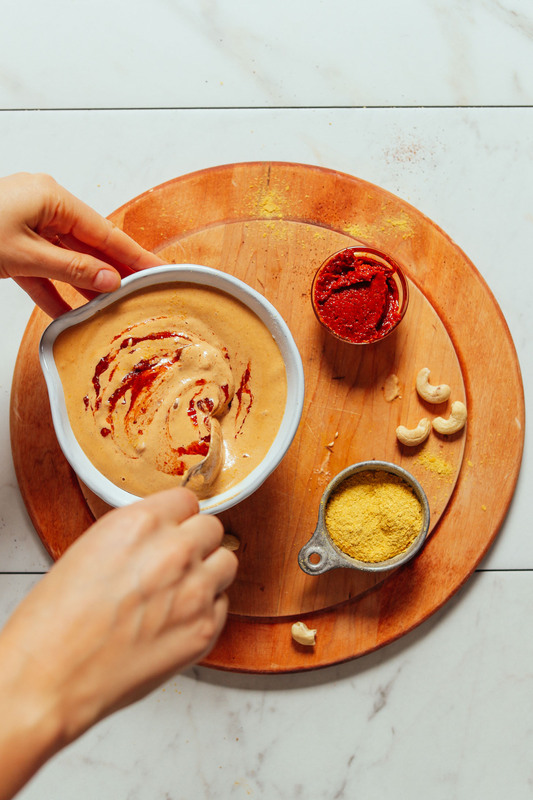 Add all ingredients to a blender (starting with the lesser amount of water) and blend until creamy, adding more water as needed to blend until creamy and smooth. We recommend a small blender (we prefer the NutriBullet), or a high-speed blender. Add just enough water to achieve a creamy, pourable queso. If it gets too thin, thicken with additional raw cashews. Taste and adjust flavor as needed, adding more nutritional yeast for cheesiness, salt to taste, cumin for smokiness, chili powder or harissa for heat, or garlic for zing. It should be quite flavorful, so don't be shy. Serve with chips or add to things like tacos, nachos, burritos, and more! Garnish with additional harissa or a spoonful of fresh salsa or hot sauce for serving (optional). Store leftovers covered in the refrigerator up to 5-7 days, or in the freezer up to 1 month. To thaw from frozen, set in refrigerator for 24-48 hours. Reheat in microwave or in a small saucepan over medium-low heat. Add more water as needed if it thickens when reheating. *Nutrition information is a rough estimate for 1 (1/4-cup) serving calculated without additional garnish, chips for dipping, or other sides. I’ve now made this 3x. OH.MY.GOODNESS. The most perfectly amazing, and easy, addition to so many dishes! Hello, can I use room temperature water instead of hot? Does that change the queso in any way? I cannot blend hot liquids in my ninja. That should be okay! The hot water helps it blend better, but room temperature will likely work just fine. Hope that helps! Oh man, so good! So I really like the jalapeno flavor in my cheese dip, so, I replaced 1/4 cup of the water with jalapeno juice, and of course added jalapenos too :-) Delish! Forgot to rate! It was great! I’ve made this three times now, so easy and yum! First time I did with harissa and we liked it but it wasn’t “nachoey” enough. Second time I added some lemon and pickled jalapeño. SO GOOD. Tonight I subbed the harissa with Valentina hot sauce and the family gobbled it up! So versatile and fast… thanks for the great recipe! This recipe is awesome! I love the cashew-less queso recipe (with eggplant) and actually haven’t made a cashew-based cheese sauce yet though have eyed the super expensive ready-made brands. Queso was once of my favorite snacks as a non-vegan but I always hated how I felt afterward. This dip tastes super creamy/cheesy and is warm enough from the hot water to use right away. I used it for nachos and it was so delicious. I forgot to put garlic in it but had a bunch of garlic in the nacho toppings so it wasn’t a big deal though more garlic would make it even better. My nachos consisted of Trader Joe’s unsalted tortilla chips drizzled with the queso and topped with sautéed red bell pepper, soyrizo, black beans and crimini mushrooms topped with chili lime seasoning + fresh cilantro with the tomatillo salsa on the side. This review is in no way sponsored by Trader Joe’s. 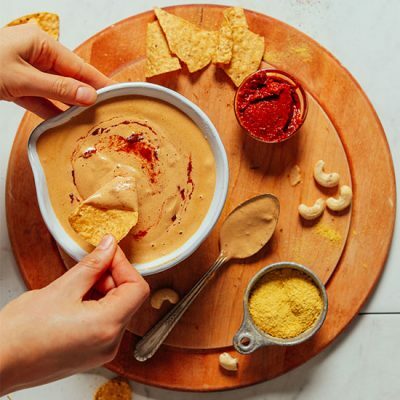 I’ve made several versions of vegan queso from different books and blogs including some of your other queso recipes and this one is by far my favorite and the easiest too! Double win! We made it with the adobo peppers and it was super tasty with a great consistency. Definitely will be making this more often…you rock as usual! THIS! WAS SOO GOOD! Honestly, this was perfect. We devoured it. Thank you! Whoop! thanks for sharing, Libby! Hi there. Could I substitute almonds for the cashews? We haven’t tried that, but it might work! If you give it a try, we would love to hear how it goes! This was really great! The consistency was amazing and I doubled up on Chipotle peppers to add smoke. Delicious!! Yay! thanks for sharing, Robyn. Hey Dana I’m making this right now and I know it’s gonna turn out awesome. I’m using a mix of alderwood smoked salt and pink salt and roasted black garlic in it! I just wanted to say I have been following your blog for many years, since you had only a dozen or so recipes, and I was vegetarian and then vegan for a really long time. As of last month I decided to add (wild caught/hunted) animal protein (not dairy!) back into my diet (once or twice weekly) for similar reasons to you and I am feeling better so far. Still totally open to going back to being vegan-ish. The labels are such a pain! I have used honey this whole time and find it no less disturbing than drinking tree blood, aka, maple syrup and it does save the bees in our human-altered world. I also have leather hiking boots because I work in the realm of forestry and have to be around very hot fire and other things that require leather. Besides, what’s better for the environment, leather or (current) synthetic materials? ANYWAYS that was a tangent, but it brings me so much relief that you told a publicist that you eat a diverse diet without labels. That gives me so much courage to be open about my own diet when others ask. I know they are not entitled to an answer but I don’t want to feel like I have to lie anymore and your response is so helpful to me. Vegan meals are still totally awesome and the major component of my diet and I am excited to see what you’ve got cooking for the future :-) thank you! 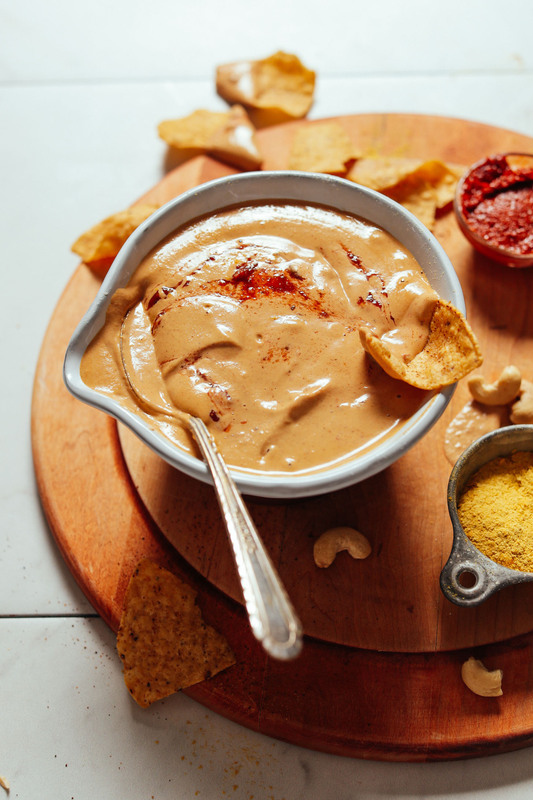 Isn’t this pretty much the same recipe as your Vegan Mexican Cheese (the queso version)? Easy and so delicious! Thank You for creating this; my craving for dairy cheese has finally been taken care of. Hi! I was wondering how much it would change the flavor if I substituted roasted/salted cashews for the raw ones as that is what I have on hand at the moment. Will it still work? Thank you, love your recipes!!! Hi Christy, we haven’t tried that, but it might work! You may want to omit the salt and then add to taste. If you give it a try, we would love to hear how it goes! Holy moly! This looks SO good. Can’t wait to try it. We tried reheating the leftovers in the microwave and it was inedible after. Yeah, we find it’s best to slowly heat on a stovetop and add dairy-free milk or water as needed to thin. The cashews tend to thicken it when reheated. Will add a note! Absolutely so easy, quick AND divine! Thank you! I want to put on everything! Left out the Chili powder as did not have, and used chipotle in adobe, was plenty flavorful. I’m another person that agrees on a squirt of lemon for tang and a fresh note to add balance. Lovely! Thanks for sharing, Beth Ann! Made this tonight. I had never used Harissa before, picked some up yesterday and the sauce is delicious!! So easy, can’t believe how good it is. Thank you!! Yay! Thanks for sharing, Sara! Wow this was delicious and easy to make! I had hot salsa on hand so used that and it was fantastic. Once mixed I added another tablespoon of so of salsa for texture and added flavor. I will definitely be making this again. I may try with macadamia nuts like some of comments suggested just to experiment with. Thanks for the recipe. This sounds delicious and easy. I’ve made some other cashew dishes, like whipped cream and milk, and they are fine–not a long shelf life however. Question: What could I use beside nutritional yeast in this recipe (and so many of your other recipes)? I have a bad reaction to it. Thanks. So in your instance I would suggest upping the salt a little and compensating on flavor with a bit of chickpea or soy miso if you can OR just garlic powder!! Hope that helps, Karen. Ooo yes! This looks great for my birthday party coming up! Woot, woot! Lovely! thanks for sharing, Tatiana! We made this last night with tacos and it was delicious! We tried to make them like the cheesy gordita crunch or double decker, where you wrap the soft shell around the hard shell for the taco and we used this cheese to stick them together. It was perfect for that and the leftovers were great as a dip. Such a smart use! Thanks for sharing, Nicolette! I am travelling at the moment and really miss my blender,when I see a recipe like this! I don’t know of any batter-operated. But the Nutribullet is our go-to small blender. This was really simple and delicious! Took just a minute to grab the ingredients from my pantry and throw them into my little blender. We poured it on top of a savoury potato style meal loaded with yummy stir-fried nuts, seeds and peas. I’m imagining using this in place of sour cream in the future too. yay! Thanks for sharing, Tracey! 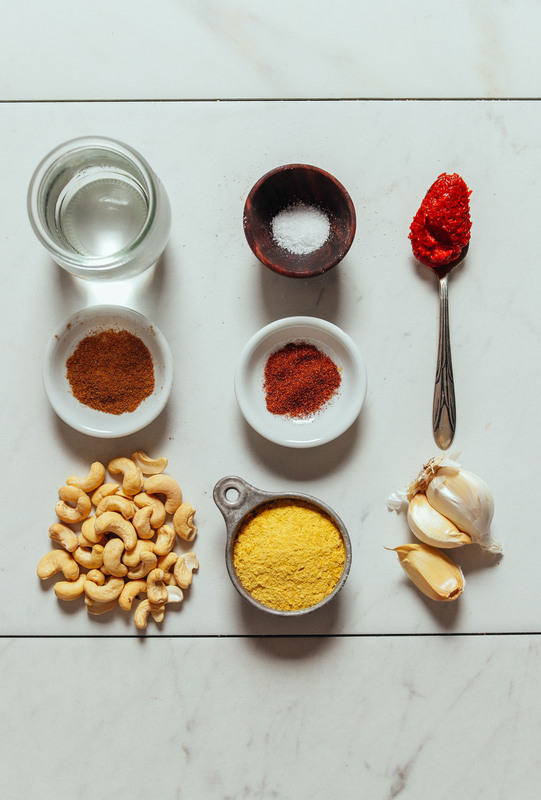 Hi – what’s the trick for the cashews if you don’t have time to soak them? I didn’t soak at all for this recipe and it turned out perfect. I normally just boil them quickly while I get everything else together. 10 minutes usually does the trick. Hi all! This recipe doesn’t require soaking cashews, which is what makes it so quick! But you could still soak them in cool water overnight, OR in very hot water for 1 hour before draining and blending. Hope that helps! This is the trick! Recipe has you add hot water to throw cashews, do first so it sits while you add the other ingredients then blend until smooth. Works great in my Bullet blender no soaking required! I recently found through a blood test that I have a food sensitivity to several foods that I’ve been using in Vegan recipes; one being cashews. I know they make for the best sauce but what would you consider to be second best? I also cannot have sesame, lemon,or any kind of pea. UGH! Maybe try macadamias, canned cannelloni beans, or silken tofu? Karen, if you can have soy try subbing silken tofu. Or, I agree, perhaps another nut such as macadamia or blanched almonds? Or, soaked sunflower seeds or hemp seeds? 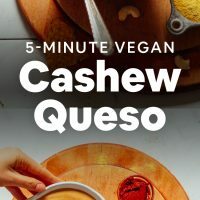 There is a link in the post to Cashew-less Vegan Queso. Macadamia nuts are my go-to for sauces….more expensive but taste excellent. And not as harsh as cashews can be to the immune system . Hi Michelle, if you can have soy, try subbing silken tofu. Or perhaps another nut such as macadamia or blanched almonds? Or, soaked sunflower seeds or hemp seeds? Hope that helps!